With president Jeff Cassell at the helm, Hudson based TAPTCO Transit and Paratransit Company has been offering renowned services with their bus driver training course and products including high quality videos and books for over twenty years. Previously their work had been private label and not available to district fleets until now. The Transit & Paratransit Company has a team of performance improvement experts with specialties that include fleet operations and safety, industrial psychology, instructional design and media production. They have worked hard and diligently to make sure drivers, passengers and pedestrians have the safety knowledge they need to be able to handle any situation. TAPTCO believes in setting safety normals, or NORMS, and want to set the standard for drivers to “Do it right, the first time, every time” in everything they do. When this happens, accidents can get reduced by up to 50%. When you start with the basics and offer drivers the best bus driver training course like the one at the Tranist and Paratransit Company, it sets the foundation for everything else you do. The drivers will be trained to avoid accidents and the program will change their behavior on the road. 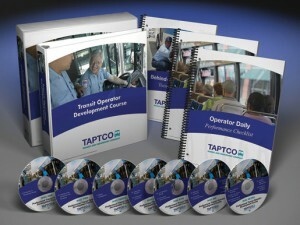 If you need transit or paratransit drivers trained, TAPTCO is the place you need to go. They’ll make a difference guaranteed.